pappsy314 changed some attributes to No Spirit Emblem Cost: Summary changed. ; Description changed. pappsy314 changed some attributes to No Spirit Emblem Cost: File 'No Spirit Emblem Cost' category changed to Old versions. pappsy314 changed some attributes to Rebalanced Spirit Emblem Economy: File 'Rebalanced Spirit Emblem Economy' description changed. pappsy314 changed some attributes to Rebalanced Spirit Emblem Economy: Description changed. pappsy314 changed some attributes to Rebalanced Spirit Emblem Economy: File 'Ceremonial Tanto changes only' category changed to Old versions. pappsy314 changed some attributes to Rebalanced Spirit Emblem Economy: File 'Emblem cost changes only' category changed to Old versions. pappsy314 changed some attributes to Rebalanced Spirit Emblem Economy: File 'Rebalanced Spirit Emblem Economy' category changed to Old versions. pappsy314 changed some attributes to No Spirit Emblem Cost: Description changed. 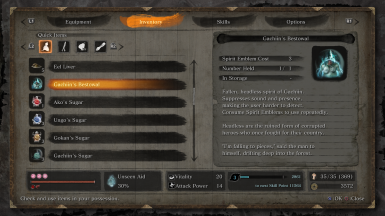 pappsy314 changed some attributes to Rebalanced Spirit Emblem Economy: Summary changed. ; Description changed.